Bestia, the newest hotspot for LA downtown dining, is appropriately named for a few reasons. It’s a beast to find, park and get a reservation. It seems everyone wants a table to try Chef Uri Menashe (formerly of Osteria Angelini) innovative take on Italian fare. I visited last on a Tuesday night to a packed house. Located in an old industrial warehouse in the Arts District of downtown, the only clue tipping diners off of Bestia’s location is its spray painted name and valet stand on the alley below the restaurant. 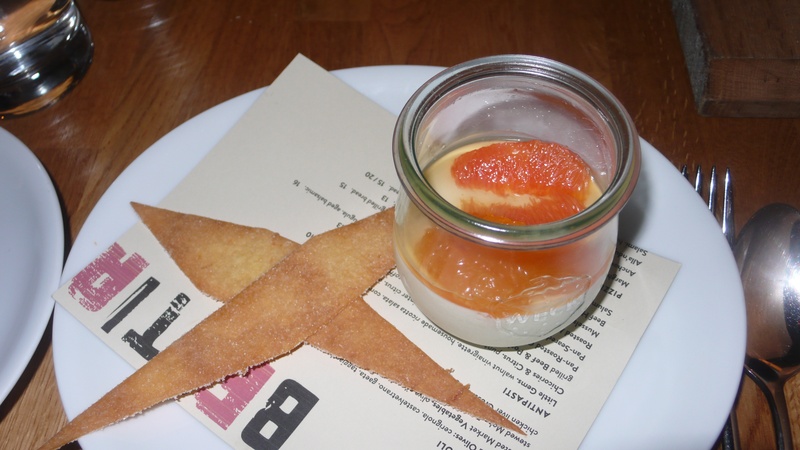 Inside, Bestia has an upscale urban architectural fell with exposed brick walls, concrete floors and an open kitchen. The L shaped interior space is divided into a main dining area with small booths, communal tables and a long charcuterier bar featuring a salami counter with marble tabletops. I recommend trying to snag a seat in the middle of the restaurant so you can view the open kitchen, salami case, and have a view of all the tables. Another good spot is at the bar right in front of the salami table, where you can view chefs slicing a variety of meats for the delicious house cured meats appetizer. 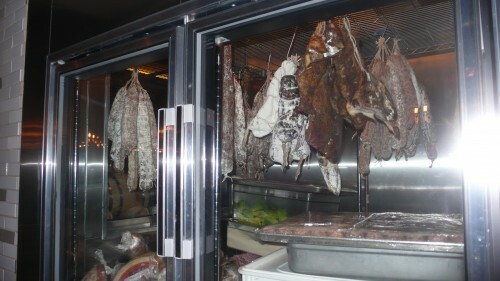 Here is what my friend and chef in training Travis and I sampled at Bestia. The wine list is predominately Eastern European including lambrusco, pinot grigio and moscato from the Friuli wine region. 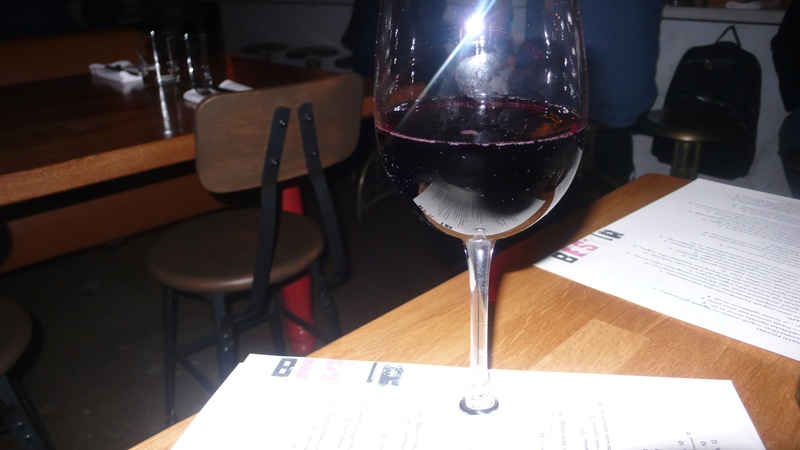 I started off with a lovely bubbly salamino lambrusco. 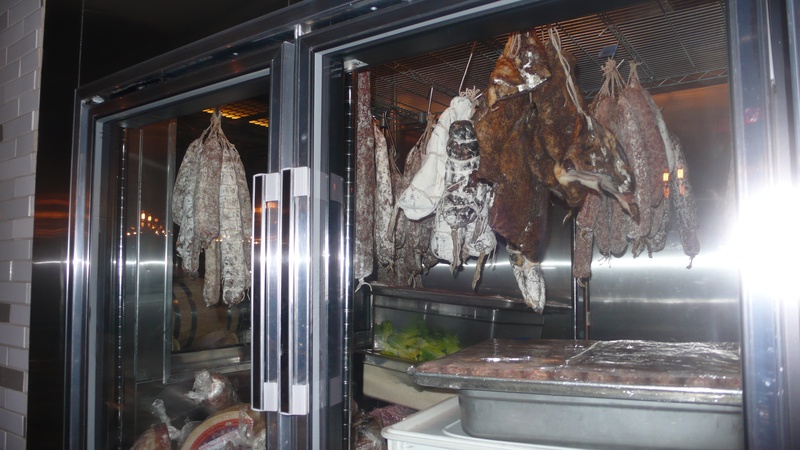 Antipasti are both traditional and adventurous including a housemade selection of cured meats, grilled sardines, roasted bone marrow, chicken gizzards and beef heart tartare. 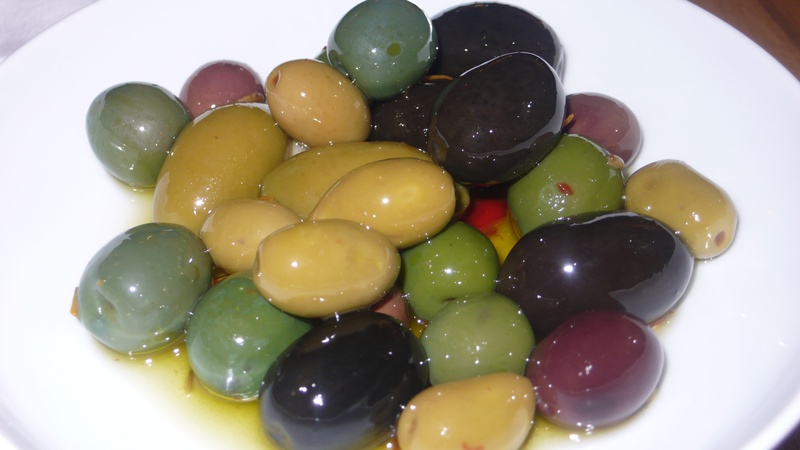 We began with the marinated olives including cerignola, castelvetrano, taggiasche, gaeta and picholine. Next we sampled the delicious and hearty chicken liver crostini. 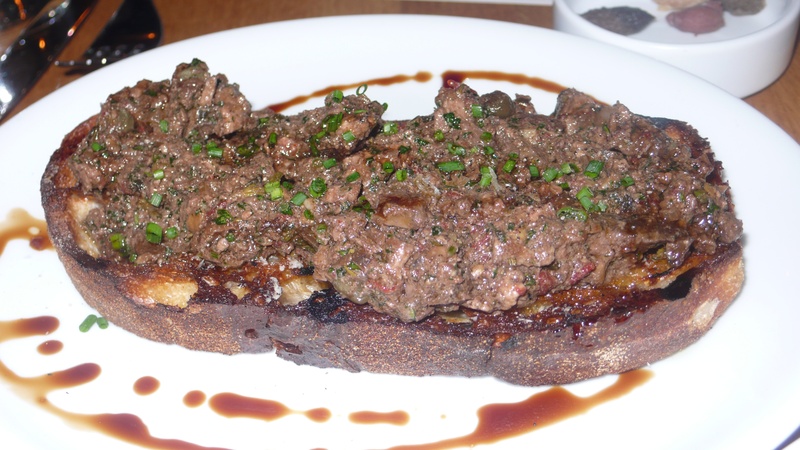 We loved the the thick meaty chicken liver paired with aged balsamic and sea salt over a big piece of charred bread. Yum. Our salad choice was the Bloomsdale spinach with shaved carrots, radish, baby fennel and sieved egg with a lemon oregano citronette. The citrus dressing paired well with the slightly bitter spinach and vegetables. 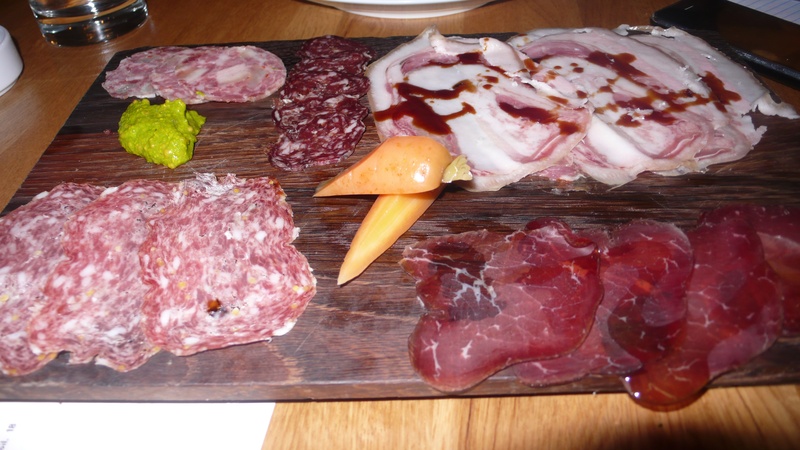 Bestia is known for their house cured meats, so of course we had to try the salami plate. Here we were served a selection of all the cured meats paired with pickles and a lovely tangy mustard and crunchy bread. We loved this combination. When we return to Bestia we will definitely order the meat board and the chicken liver crostini again. Main courses include a variety of rustic handmade pizzas, pastas and a small selection of seconds including dorade, braised pork and hen. 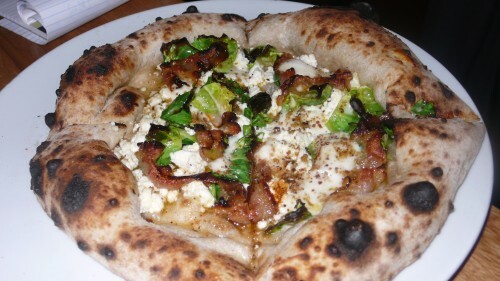 We tried the guanciale pizza with ricotta, brussels sprouts, chili oil and breadcrumbs. The crust was heavenly, light and charred. Our only complaint was that we would have liked a bit more guanciale included. 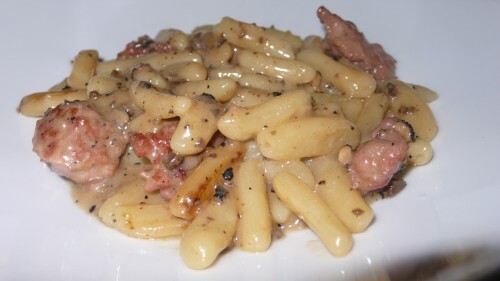 Our pasta dish was the fave of the night, Cavatelli all a Norcina. Plump ricotta dumplings, housemade pork sausage, black truffles and grana padano. Often times truffles overpower when used in a pasta dish, but here they blended perfectly to create a bowl of dumplings that we wanted to dive into. I noticed many other tables using the house bread to soak up every last drop of this sauce. It is worth a trip to Bestia simply to enjoy this dish. Desserts, made by Menashe’s wife pastry chef Genevieve Gergis, are seasonal and include chestnut doughnuts with coffee gelato and whipped cream, crème fraiche panna cotta with huckleberries and a persimmon and pistachio cream tart with buttermilk gelato. 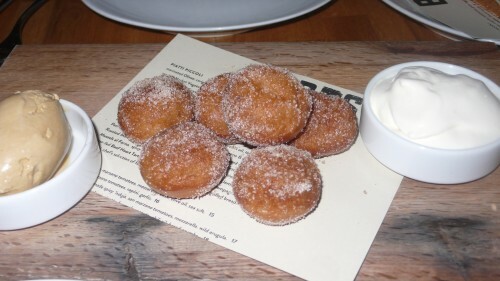 We tried the light and airy spiced chestnut zeppole with whipped cream and coffee gelato. Travis loved the strong coffee taste of the gelato. We also were served the creme fraiche panna cotta, also lovely, served with winter citrus meyer lemon cookies. 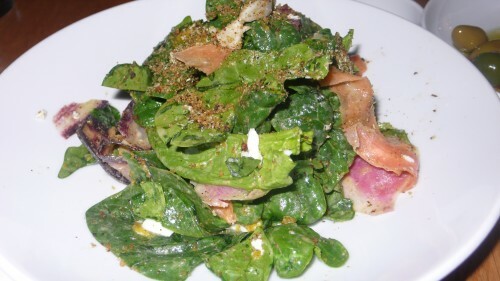 If you’re looking for rustic Italian cuisine at a reasonable price, head to Bestia. Located at 2121 East 7th Place, reservations a must, 213/514-5724.